I have this conversation with almost every couple, and most of the 2nd shooters I shoot with. We discuss the ring shot – the photo of the beautiful ring or rings at your engagement or on your wedding day. I ADORE the ring shots that are just the ring and you can see all the sparkle – but I do not do that. I try to make the photo of your ring, and art piece. Something that you would want to hang on your wall and gaze at for generations. So I scope out many locations, and try many many shots to get just the right one. There was a wedding, I only had a few minutes to get the shot, so I just rolled up some blades of grass and put the rings on that – it turned out BEAUTIFULLY ! Your husband / fiancee spent a long time deciding which ring is best to adore your finger for a lifetime – so I want you to be able to enjoy it years after the proposal and wedding day has passed. After it has gotten scratched up, maybe lost down a sink ( hopefully this doesn’t happen ! ), or you can’t wear it for months during pregnancy. I want you to look at that photo, and remember the day he got down on one knee, popped that questions – and said I DO ! I want you to be able to put a collections of your wedding photos together on your wall, and include your ring, bouquet and you two. Along with all the other photos you love and enjoy. 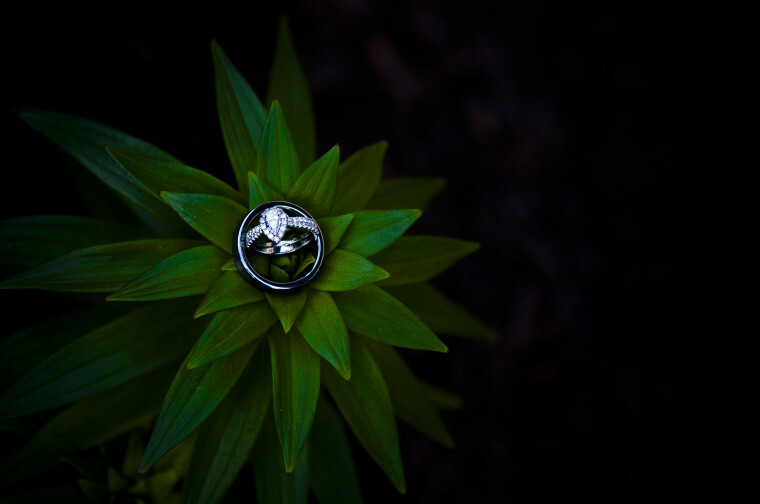 I LOVE all of the photographs of my rings, but this one will always be my favorite of 2013 – I took this at Anna and Kyle’s wedding reception at the Ale House in Waupaca – it is in the front entry way onto a plant. Every time I look at it I smile, and think it’s freaking beautiful !